Some 30% of Netflix subscribers pay for its US$11.99 per-month premium tier – up from 21% in late 2017 – despite an October 2017 price rise, according to US-based Parks Associates. 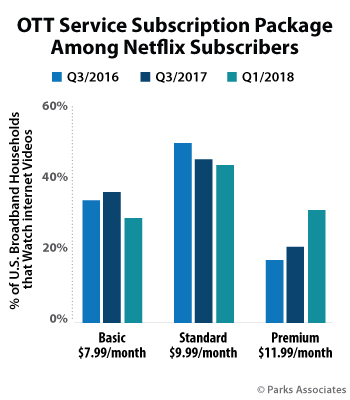 The research firm’s data suggests that uptake of Netflix’s US$7.99 per-month basic tier has fallen from 35% to 27% over the same period, while its US$9.99 per-month standard package remains its most popular. “This shift reflects trends that we are seeing across the industry, beyond Netflix,” said Brett Sappington, senior director, research, Parks Associates. “Netflix’s basic tier is limited to one screen and SD quality, while the premium tier offers viewing on up to four screens and access to Ultra HD content.